The Lord told us through St. Gertrude that the renewal of the world – which then would be tired, sluggish and without fire in the heart – would come by listening to the beating Heart of Jesus – His beats of love. Those times, which were prophesized by Saint John to Saint Gertrude, are here now. Jesus Himself has revealed the devotion to His Divine Heart. In this final attempt of His love, He has given it to the world in these last centuries in order to warm the frozen world; to save souls that are being lost; to be a sure means of calming divine justice and of reaching the mercy of God; and to serve as an abundant fountain of blessings (Jesus to St. Margaret Mary). “My Divine Heart is so full of love towards humanity that, not being able to contain the flames of its ardent charity, it necessarily must give them away and manifest them to all, so as to enrich mankind with its precious treasures – treasures that contain sanctifying and saving graces necessary to redeem man from the pit of destruction” (Jesus to St. Margaret). “The Church and society,” said Pius IX on September 9, 1860, “have no other hope than that of the Heart of Jesus; He alone will cure them of all their aches…We are living difficult times. Everything is in danger, both in the spiritual order as well as in the temporal. In the midst of such great calamities which weigh upon the world, it is absolutely necessary that we immediately revive our devotion and together pray that the Divine Blood that flows from His Heart may protect us, may attract us to Him with the bonds of the most ardent charity, may inflame all men with the sacred fire that consumes Him, may inspire in us the sentiments that motivate Him in order that they may be made pleasing to God with a life full of good works and merits” (cf. Audience with Fr. Chevalier). Jesus told us through St. Margaret that the human heart was becoming indifferent and cold, that the fire He had brought into the world was being extinguished in many hearts, that everywhere sin was overflowing, and that many were falling into ways of perdition. In other words, the prophecy of Matthew 24:12 was being fulfilled: “and because of the increase of evildoing, the love of many will grow cold.” Because of this loss of love and coldness in charity, Jesus, therefore, offered His Heart to re-animate the flame of love’s fire, in order to give us the very fountain of Love itself: His Heart. “The Heart of Jesus is the providential reserve that is kept for our times by the goodness of God…No other devotion is more appropriate for the needs of modern times. To the selfishness of our era, to its sensual tendencies, its religious indifference, the most delicate, pure, disinterested, tender and compassionate cult is offered as remedy” (Monsignor Baudry). The devotion to the Sacred Heart of Jesus responds perfectly to the needs of our times as well, for it is an effective remedy against the human passions that degrade man; it combats selfishness, concupiscence, ambition and gives us the virtues that oppose them. In regard to the errors of this generation, it provides victorious weapons to battle against them and destroy them. The Heart of God-made-man who entered in direct relationship with humanity. The Pierced Heart of God – from which the Church was born – robed in divine strength and with a supernatural power that has the life of the souls and of societies within it. Because of this, Pope Pius IX consistently told the Church that the Sacred Heart of our Lord was the remedy destined to save the world; for this Heart makes visible a God who reveals and manifests Himself in the life of His people, a God who desires to establish a kingdom of love. Pride: You will know them because they manifest their disdain on all that signifies a prompt, complete and absolute obedience to the decrees and mandates of the Holy See. They will consider themselves as wiser than the Church (cf. no.5). Servility towards the state: They worship civil power, without having the courage to expose that which is contrary to the truth, and they place themselves in the favor of a false liberty (cf. no.3). A spirit of division: This is the most dangerous error because it is hidden behind a veil of charity and of mercy. They call the children of the Church, antiquated, slow and obstacles to progress (cf. no.4). He opposes pride with His profound humility and by becoming little. He opposes independence with His obedience: “Obedient to death, even death on a cross” (Phil. 2:8). He opposes servility to the world with His noble and firm generosity. He never bowed down to Caesar to gain favors, and He will never bend to the multitude in order to gain popularity. He opposes the spirit of division with His immense charity and ardent zeal for unity. This is illustrated beautifully in His priestly prayer in John 17. The Heart of Jesus asks for true union; to break it would signify great injury. Blessed Pius IX saw a remedy in the Heart of Jesus against liberalism, and therefore approved, by a Solemn Consecration on June 16, 1875, a formula in which is found a prayer for the conversion of liberalistic Catholics. As well, in his words to the Founder of the Missionaries of the Sacred Heart, Fr. Chevalier, he said, “Grow and multiply. The Church and society have no other hope but in the Sacred Heart of Jesus; He is the One who will cure all evils. Preach everywhere devotion to the Sacred Heart, for it will be the salvation of the world…Hurry in organizing and forming it (Sept. 9, 1860). For Blessed Pius IX, the Sacred Heart was everything! He saw in it the Hope of the Church and the salvation of modern society. When the consecration of the World to the Sacred Heart was suggested to him, he agreed that it was necessary for the Divine Heart to exert its sovereignty over the world. Furthermore, the universal consecration of all Christians to the Sacred Heart that was done on the 16th of June, 1875 was done on the 2nd centenary of the Apparition of our Lord to Saint Margaret and on the 30th anniversary of the elevation of Pius IX to the See of Peter. Pope Leo XIII continued the vision of Pius IX. Pope Leo XIII discovered Our Lady of the Sacred Heart and considered Her devotion as the sure path to the Heart of Jesus in order to receive the graces of which He is the origin. He animated the faithful to take refuge in Her because she has all the treasures of the Heart of Her Son in Her hands. Furthermore, he elevated the Feast of the Sacred Heart to a first class feast (June 28, 1889) and approved the Litanies to the Sacred Heart and its public recitation (May 25, 1899 in Annum Sacrum). He consecrated the month of June to the Sacred Heart and gave great momentum to the devotion of First Fridays of the month. He proclaimed the Sacred Heart to be the salvation of humanity and the remedy of its evils. He desired that nothing would be outside of the influence of the Sacred Heart as He considered it to be the remedy of all the problems of modern times. What else did the Pope of the Sacred Heart, Leo XIII, do? We must remember that he is the pope who, in 1884, saw the image of the devil challenging the Lord about the power that he wielded over the world and the Church; therefore, he wrote the prayers to St. Michael. As well, he had the vision of an eagle that made him capable of understanding systems of deceitful philosophies, materialistic doctrines and antisocialism that were spreading themselves more and more. With this insight and understanding, he was able to grasp the problems of his generation with the sureness of a most profound vision, delving into the open wounds that afflicted it and recognizing with clarity the dangers present. Knowing that the Lord said in the Book of Wisdom that nations are capable of being cured (1:14), he asked himself, “What effective remedy we can apply?” After much prayer and mature reflection, he proposed the Sacred Heart of Jesus. To a society that was sick, the Vicar of Christ offered the only possible remedy that could cure it. On the 25th of May, 1899, he promulgated the Encyclical Annum Sacrum, which was on the consecration of humanity to the Sacred Heart. He then did the consecration on the 11th of June – the Feast of the Sacred Heart. In this encyclical, he explained the importance of this consecration of the entire human race: “When the Church, in the days immediately succeeding her institution, was oppressed beneath the yoke of the Caesars, a young Emperor saw in the heavens a cross, which became at once the happy omen and cause of the glorious victory that soon followed. And now, today, behold another blessed and heavenly token is offered to our sight - the most Sacred Heart of Jesus, with a cross rising from it and shining forth with dazzling splendor amidst flames of love. In that Sacred Heart all our hopes should be placed, and from it the salvation of men is to be confidently besought” (AS, 12). 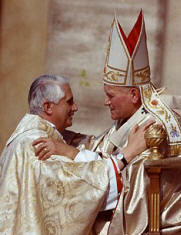 Together with the encyclical, he sent out the formula for the Consecration. In this encyclical, Pope Pius XI centered his attention on the spirit of expiation and reparation that was necessary in these times, highlighting the duty of consoling Christ and of uniting oneself to His Passion in order to expiate with Him one’s own sins and those of the entire world. This coincided with the revelations of the Merciful Heart to St. Faustina, which were also occurring during those times – “For the sake of His sorrowful passion, have mercy on us and on the whole world” (1935). With great seriousness in his tone, touching on civil and religious issues, the Holy Father described why he considered the modern world to be in the power of the evil one. He spoke of the prophecy in which the love of many would grow cold. Because of all of this, he asked that reparation be made, so that, through it, mercy and the graces necessary for the salvation of the world could be brought down. He knew that “where sin abounds, grace abounds all the more” (Rom 5:20), but he believed that this abundance of grace would come only through reparation. Therefore, he ordered the prayer of reparation that he had promulgated to be prayed on the Feast of the Sacred Heart. Giving the theological and dogmatic foundations of the devotion, this was (and still is) the encyclical par excellence on devotion to the Sacred Heart. “Faith languishes, hope in eternal life has darkened, and the works of the impious grow worse. More than ever, this seems to be incited by the infernal enemy and his implacable hatred against God, the Church and him who represents Christ on earth” (cf. HA, 117). In the midst of the evils that besiege individuals, nations, families, and the entire world, where can we find a sure remedy? Pope Pius XII concluded in this encyclical that the devotion to the Sacred Heart satisfied the current needs of the Church and of humanity. For what can be more efficacious than the love of Christ revealed and manifested in His Heart? As well, he considered devotion to the Sacred Heart to be a sign and source of unity, salvation, and peace. He did not hesitate in offering the devotion to the Sacred Heart as a sure school of divine charity. In this school, the Kingdom of God – so needed in souls, individuals, families, societies, and nations – can be founded and established on a most solid foundation. With this encyclical, he augmented the devotion to the Sacred Heart so that its reign and empire of truth, holiness, grace, justice, love and peace could be extended throughout the world. He concluded by saying that in order for this devotion to produce greater fruit for the good of humanity, the faithful should unite it to devotion to the Immaculate Heart of Mary, for our salvation is the fruit of the love and sufferings of Jesus Christ, which were intimately united to the love and sufferings of His Mother. He also invited the faithful to give the Immaculate Heart acts of love, piety, honor and reparation (no.124). Furthermore, he consecrated the Church and the entire world to the Immaculate Heart in 1942, and he gave a special blessing to all those who consecrated themselves to promoting and fomenting devotion to the Sacred Heart of Jesus. His Holiness John Paul II: Pope of the Civilization of Love. “I have, on different occasions, expressed my conviction that devotion to the Sacred Heart corresponds, more than ever, to the expectations and needs of our time. I have stressed the fact that the essential elements of this devotion belong, in a permanent way, to the spirituality of the Church throughout her history” (cf. John Paul II, Paray le Monial, October 5, 1986). Our Holy Father is also convinced that devotion to the Sacred Heart of Jesus is an extraordinary remedy for the extraordinary needs of our time. “Christ offers his human and divine Heart, source of reconciliation and principle of new life in the Holy Spirit, to today’s men and women who are immersed in a secularized world and risk losing the centre of gravity in their lives” (John Paul II, Angelus Message, June 28, 1998). We live in a world that has separated itself from God, and therefore, has lost its center. Everything is altered: faith, relationships with God, morality, family life, the identities of men and women, the values of life, etc. Let us look more in depth at some of these realities and how the Heart of Jesus can remedy them. Lack of Faith – Saint Thomas saw the Heart of Jesus, and this experience penetrated his doubts; he placed his finger in the wound of His Side and thus exclaimed with ardent faith, “My Lord and My God” (Jn 20:28). Lack of Unity – His love brings all creatures to Himself and causes those who believe in Him to have a single mind and a single heart. While hatred divides, separates and destroys, love, on the contrary, unites, brings peace and edifies. This is why only love perfects all things. The essence of mutual love does not consist in the fact that nobody causes us pain – which is impossible while living amongst one another – but rather in learning to forgive with promptness and perfection. Lack of peace – His Heart is a sign of reconciliation, which is the basis of peace. In His Heart, man finds his weakness and misery, as well as his greatness in being a child of God. Only from His Heart does peace flow. When Christ appeared to the Apostles, He showed them the wound of His Heart and told them, “Peace be with you” (Jn 20:19). Peace is a fruit of the love of His Heart. Abundant fear – When one is able to contemplate the image of the Merciful Heart of Jesus that pours forth graces and hear within the intimacy of one’s soul what St. Faustina heard – “Do not be afraid of anything; I am with you” – he will be able to respond with confidence: “Jesus, I trust in You.” This dialogue of the Heart of Christ with the heart of man is based on love, for “there is no fear in love, but perfect love casts out fear” (1 Jn 4:18). A cold world – Coldness is the fruit of selfishness. As iniquity increases, the love of many will grow cold. For this reason, it is necessary in our times to draw close to the flame of ardent love and charity in the Heart of Jesus. The love of Christ does not cease nor deteriorate in any way. His love is eternal. It is the only love that is capable of transforming the world and human life. It is the only love that is capable of causing human hearts to become enflamed with love. “The devotion to my Heat is my last effort to warm a world that has grown cold” (Jesus to St. Margaret). A world in need of love – “God has made us for Himself [He created us for love, to love and to be loved], and our hearts are restless until they rest in Him” (St. Augustine, Confessions. Italics added). Love is the force behind our existence. This means that the fullness and maturity of our humanity is reached to the extent that we experience the love of God, we know and believe we are loved by Him, and we love others. The human heart is always hungry and thirsty for love. Its greatest desire is love. Therefore, if we do not live in love, our hearts are robbed of its greatest desire. Our full human development – on all levels, not only the spiritual – is reached to the extent that the human person experiences love. It is a grave error to think that we reach this fulfillment outside of love. Selfishness robs us of our dignity and leaves us in a state of immaturity. There is no fulfillment outside of love. Our dignity is found in being children of God; therefore, we live in and for love. “See what love the Father has given us, that we should be called children of God; and so we are” (1 Jn 3:1). The breakdown of the family is because of selfishness and lack of sacrifice. Love is nurtured on sacrifice. There is no love without sacrifice. And in the works of God, nothing great can become greater without suffering. In a letter from Warsaw on June 11th, 1999, on the 100th centenary of the consecration of the world to the Sacred Heart, Pope John Paul II wrote these words: “From the Heart of Christ crucified is born the new humanity redeemed from sin. The man of the year 2000 needs Christ's Heart to know God and to know himself; he needs it to build the civilization of love” (quoting his own words from June 8, 1994; L'Osservatore Romano English edition, 15 June 1994, p. 3). Man has erred. He must return to the path of truth. Darkness has invaded souls, but this darkness can be dissipated with the light of Truth. “Death has seized upon us, and we must lay hold of life” (Annum Sacrum, 11). Those who contemplate the Heart of Jesus become transmitters of light and of life; they recognize their own dignity and destiny. The Heart of Jesus transforms the human heart, leading us to have His sentiments. Therefore, the new evangelization must be established by those who contemplate and live in the Heart of Jesus. It is urgent that the world understands Christianity as the religion of love; thus, it is necessary to have devotion to the Sacred Heart so that missionaries of love and truth may rise up in the world. This is why John Paul II expressed his profound approval and support for all those who, in some form, continue to promote the devotion, knowledge and study of the Heart of Jesus, and it is why he asked for it to be transmitted to future generations. Devotion to the Sacred Heart allows us to transform stony heart to hearts of flesh. The Heart of Jesus – since it is the burning furnace of charity, the fountain of salvation, and the abundant source of grace and salvation – is our hope. On September 1st, 1939, Hitler’s army crossed the Polish border, massacring whomever they found along the way. As a result, the Allies declared war against Germany. On September 5th, 1939, the printing machines of Niepokalonow, the City of the Immaculate, were silenced; the storm was advancing. The German air force bombed Warsaw, and when passing over Niepokalonow, they dropped some of their bombs upon the Marian city, causing physical damage but no harm to any of the brothers. Only the religion that teaches the love of God and brethren can perfect the human person. Jesus has taught us what perfect love is. The Incarnation is the entrance of God into human life – into his culture, work, and environment – in order to transform it. Culture, to be authentically human, must accept love. The devotion to the Heart of Jesus creates a culture of life, love and peace.